These 5 kits represent the best survival kits on the market. Each one is prefabricated, so you don’t have to worry about putting it together yourself, has most (if not all) of the things you’ll need to get by for a couple days, and has quality components. If you’re interested in putting together your own survival kit, you can check out our bug out bag guide for ideas on how to get ideas on how to do it. One thing that you’ll notice here is that there’s no half-baked gear in this line-up. Most components are from respected brand name companies. Can actually keep a family of four going for 72 hours. Useful out of the box without any real need to add anything to it. The following is included in the kit: 1 backpack, 24 Mountain House servings, 48 Packets of Datrex water (6 liters), 1 Sawyer Squeeze, 8 Cyalume SnapLights, 2 LED lanterns, 2 flashlights, 1 First Aid Kit, 4 emergency blankets, 2 bath wipes, 1 portable stove, 4 bowls and utensils, 1 MoraKniv knife, 1 Ferrocerium rod, 4 InstaFire tinder and 4 whistles. The Premium Family Emergency Survival Kit offers plenty of name brand items inside and actually can provide for four family members, unlike a lot of kits that claim they can feed a certain number of people but really don’t come close. As far as we’re concerned, this is the overall best survival kit on the market. The first aid kit in the Premium Family Emergency Survival Kit suffers from a lack of a tourniquet and any serious bandages. Add a Combat Application Tourniquet and a couple Ever Ready Battle Dressings and you’ll be good to go for any bug out situation or temporary natural disaster. Best overall value of the group. Has a water filter included. Doesn't include much food or water. The following is included in the kit: 1 LifeStraw, 32 servings of gourmet entrees, 5 water pouches (about 22 ozs), portable stove, 24 fuel tablets, stainless steel cup, squeeze flashlight, 5 in 1 survival whistle, 42 piece first aid & hygiene kit that contains 37 piece bandage kit, n95 dust mask, pocket tissues, wet naps, and waste bag, waterproof matches, mylar blanket, emergency poncho, and playing cards. A 8.5” survival knife with nylon sheath, survival kit & compass, a keychain paracord kit (with 10 feet 550 cord, alcohol pad, fire starter, tinder, foil, knife blade, sewing needle, 32.8 ft fishing line, 2 floats, 2 swivels, 2 safety pins, 2 weights, 6.5 ft iron wire), 11 in 1 card size survival tool (can opener, knife edge, screwdriver, ruler, bottle opener, 4 position wrench, saw blade, wrench), a signal mirror, wire saw, 8″ full tang knife with belt sheath & magnesium fire starter, 10.5″ axe with paracord handle, emergency tent, ceramic knife sharpener, and e-tool. The Wise Company 5 Day Emergency Bug Out Bag is a full-fledged bug out bag that goes a different route than the Premium Family Emergency Survival Kit. Rather than include a lot of food and water, it has a limited amount of food and water but provides a way to procure more. It’s the best value of the survival kits represented here. If you want to make sure you’re covered in an emergency, but don’t want to spend a ton on a kit, this is a great choice. The first aid kit will need some love to be fully capable. Like most other pre-made survival kits, it needs to have a Combat Application Tourniquet and a couple Ever Ready Battle Dressings added to it in order to meet our standards for survival kit first aid. Choosing to go with less food and water, and adding more tools is probably not the best choice for most people looking to make it a couple of days if things go bad. Packed in a dry bag to make it waterproof. The highest quality car survival kit we've seen. Designed to fit in a car door storage area. The following is included in the kit: 4-Mode LED Headlamp w/Batteries, 2 LED Glow Sticks, 1 Wristband w/LED Light & Whistle, LED Beacon w/Batteries, 4 Millennium Food Bars, 8 Water Pouches, Waste Disposal Bags, 2 Tissue Packs, 2 Mylar Blankets, 2 8-Hour Hand Warmers, 2 Body Warmers, 2 Ponchos, 2 Tubular Bandanas (warm up/cool down), 46-Piece First Aid Kit, 2 Pair Utility Gloves, Duct Tape, 2 Dust Masks, 4 Extra AAA Batteries, Waterproof Matches, Stainless Steel Multipurpose Tool, Windshield Breaker/Seatbelt Cutter. Interested in a smaller kit? The GetReadyNow Personal Car Emergency Kit is the glove box sized version of this kit. 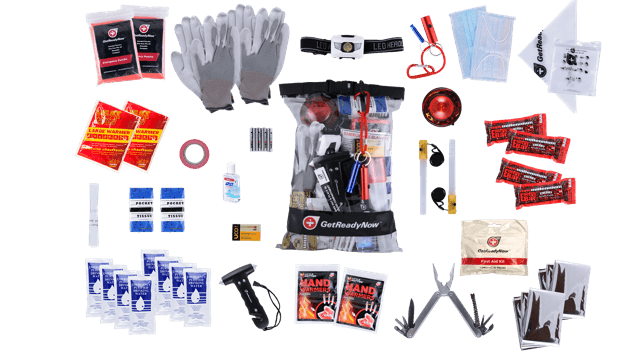 The GetReadyNow 2+ Person Deluxe Car Emergency Kit is one of the best car survival kits on the market. You’ll definitely appreciate the quality when you see it in person. This kit is the most versatile of our line up. Packed in a heavy duty dry bag, you can toss this just about anywhere and know that you’ll have an emergency kit available at a moment’s notice. It would be perfect for a boat or to have on hand in a hunting cabin. This would win our vote for the best survival kit on the market if we were looking for something to throw in a vehicle next to our road kit and first aid kit. The lack of food and water makes this less of an all-arounder than our first two kits. The good thing is it’s easy to get more food and a LifeStraw to go with it. Great base for a shelter in place kit. Ideal for people that intend to shelter in place. Not made with portability in mind. The following is included in the kit: Honey Bucket with lid, 4 2400 calorie food bars, 4 solar blankets, 24 pouches of water, 4 dust masks, 4 ponchos, 12 pack of liners, 6 wet naps, 12 hour light stick, T-5 chemical toilet disinfectant, 1 roll 10 yards of duct tape, gas/water shut off tool, 15″ pry bar, 54 piece first aid kit, dynamo flashlight/radio, 1 pair leather palm gloves, utility knife, emergency whistle, water purification tablets, waterproof matches. 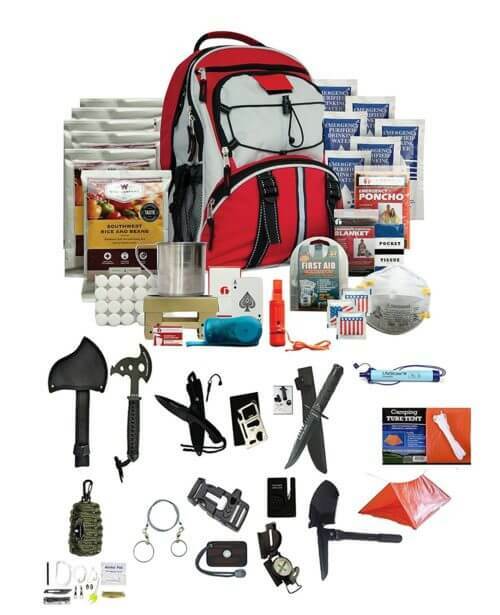 The Mayday Earthquake Kit Deluxe is a great emergency kit to put in your basement or the bedroom closet. The whole kit comes packed in a 5-gallon bucket that doubles as a chemical toilet. If you add some plastic sheeting this kit would make a great shelter in place kit. The only food and water contained in the kit are emergency rations and water pouches so you’ll want to add to it. They also don’t taste very good so adding more food and water to this survival kit will make it a better all around experience on top of adding to the length of time that you can survive. As it’s made for surviving an earthquake, it’s the least portable of the kits in our roundup. Small enough to go everywhere with you. Each item is well thought out to have multiple uses. The small size requires compromises. The following is included in the kit: Metal container, 1 Emergency Whistle and fire striker, 1 Water resistant red LED, 2 Mini Lightsticks, 1 Liquid Filled compass, 2m reflective TACTI-GLOW Firecord, 1 Wire steel saw, 1 Sheet waterproof paper, 1 Pencil, 1m copper snare wire, 1 Sewing kit, 2 safety pins, 1 #10 Scalpel, 2 Ranger bands, 1 Water carrier, 1 Water filter kit, Tinder extender in vial, First Aid kit, Fishing Kit, 1 Tampon, 1 30 cm square tin foil. The Limitless Equipment MARK 1 Survival Kit is the smallest kit in our lineup, but that doesn’t mean that it isn’t a full-fledged survival kit in its own right. Each piece of the kit is thought out to fill multiple roles. The least expensive kit by far. This is a great option for anyone looking to add a survival kit to a backpack or briefcase. Being so small means it had to make a lot of compromises to fit everything in the case. These kits fill different roles but each is the best in its class. I’m sure you’ve noticed the two drawbacks of purchasing a pre-made emergency kit, the first aid kits are all underwhelming and you end up paying a small premium to get a complete kit. As long as you’re willing to overlook those shortfalls, all of these survival kits will treat you well. What do you think is one of the best survival kits on the market? Let us know in the comments below. Be sure to hop over to our gear review page for more survival gear reviews and ideas.